With the College Football Playoff National Championship kicking off in Tampa on Monday, January 9, pigskin fans from across the country will be flocking to the sunny Florida city to see defending champs Alabama take on Clemson in a much-anticipated National Championship rematch. 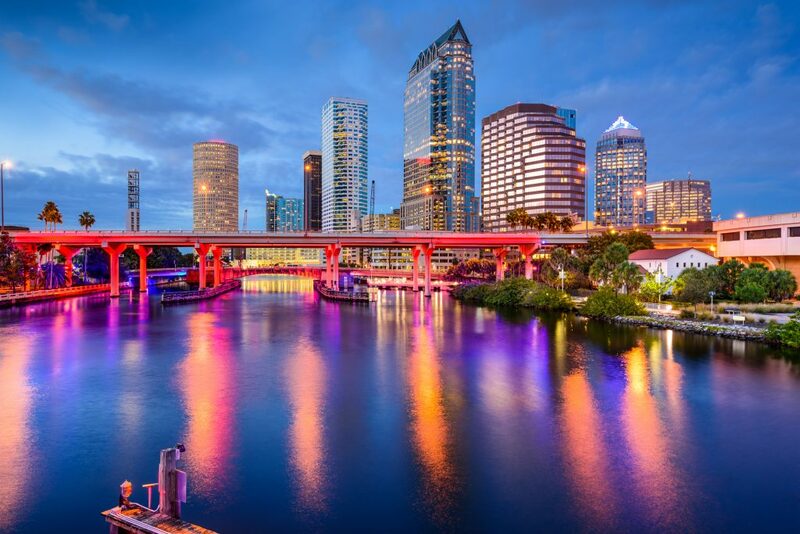 In addition to the nail-biting action going down at Raymond James Stadium, visiting fans will find much to love about Tampa, from historic architecture and wild animal parks to world-class museums and top-rated restaurants. And you can’t forget the manatees. Winter is a great time to visit Tampa – The Big Guava averages a temperate 70 degrees in January, meaning visitors can enjoy all the fun things to do in Tampa without worrying about weather woes. Below we’ve rounded up all the best attractions, eats, and accommodations the Tampa Bay Area has to offer fans heading to the championship. Dig in below to make your trip a total touchdown. In addition to its 165 public beaches and parks, the Tampa Bay Area has plenty of sports, culture, and animal-centric tourist attractions to entertain football fans of all ages. Explore Tampa’s multicultural roots with a stroll through the downtown historic district of Ybor City, which was founded in the 1880s by Cuban, Spanish, and Italian immigrants working in cigar manufacturing plants. Over the past decade the area has been converted into a world-class dining and entertainment district, but its narrow brick streets and wrought-iron balconies remain unspoiled. An essential stop for sports lovers, this homage to Tampa’s rich baseball history is located in the childhood home of the city’s first Major League ballplayer Al Lopez and features an array of one-of-a-kind memorabilia. Families looking for things to do can find fun for all ages at the Florida Aquarium, which features more than 20,000 aquatic species from around the world and rotating exhibits that are both fun and educational. This ornate movie palace from the ’20s is a throwback to a bygone era, and its stunning interior transports moviegoers to a gorgeous “outdoor” Mediterranean courtyard. The theatre’s pre-show Wurlitzer organ concert and eclectic mix of art house, foreign, and documentary films make it a perfect spot for a date night on the town. Take in a dazzling dose of culture at the Tampa Museum of Art, located along the downtown waterfront in a sleek neon-clad building designed by architect Stanley Saitowitz. This 19th century African-themed animal park has something for everyone, from family-friendly animal habitats and exotic wildlife areas to thrilling roller coasters and a water park. Housed in the opulent Moorish masterpiece that was once the Tampa Bay Hotel, this popular museum focuses on the Gilded Age tourist culture of the hotel’s 19th century guests. As beloved for its stunning architecture as it is for its fascinating exhibits, it’s a must-see for any history buff. No trip to Florida would be complete without a manatee sighting, and this Tampa Bay favorite gets visitors up close and personal with the endangered and oh-so-adorable creatures. Whether you’re eating near Raymond James Stadium or chowing down in the city center, Tampa’s diverse array of dining options is sure to hit the spot. This easygoing and reasonably priced Peruvian fusion restaurant near Raymond James Stadium is a go-to for hungry football fans looking to fill up on grilled meats, ceviche, and sangria before the game. Fans looking for more familiar fare can enjoy everything from burgers and salads to seafood, steaks, and pasta at this stadium-adjacent, family-friendly spot. For world-class steaks and seafood before the game, Eddie V’s is the spot. It’s on the pricier side, but they’ve got a great happy hour and live jazz every night of the week. Ybor City is packed with stands selling delicious Cuban sandwiches, but if you want a full meal – or if you want a sangria, cerveza, or mojito with your food – grab a seat at the gorgeous Columbia Restaurant, a Tampa Bay icon and the oldest Spanish restaurant in the United States. Fans looking to splurge in style should charge straight to Bern’s Steakhouse, an American culinary institution specializing in dry-aged steaks and fine wines. Did we mention there’s a deliciously retro dessert room for enjoying your Macadamia ice cream? From budget motels and boutique hotels to luxury resorts in historic buildings, Tampa has lodgings for every type of traveler. The name says it all – you’d be hard pressed to find a cheaper room this close to the stadium and Tampa International Airport, plus there’s a pool. The College Football Playoff is basically a holiday, and fans can celebrate without breaking the bank at this solid mid-priced option near the stadium. This high-end, Marriott-affiliated hotel is richly appointed and conveniently located near the airport, Raymond James Stadium, and tons of great shopping and restaurants. Located in a drop-dead gorgeous, hundred-year-old federal building in the posh Hyde Park area near downtown, Le Meridien is a perfect pick for college football fans looking to live it up in style.